Rock my brand. Or don't. If you can guess or figure out what song is the waveform, I'll give you a free one. I know what time it is! This is one of my favorites from back in the day. I spruced it up and relaunced it on my new spreadshirts store! Oh you wanna talk about the whistle! I've been calling around all day trying to get whistle tips put on. Stop looking around for the best person and BE that person. I just finished my page highlighting some of my favorite shirt designs from over the years. New Shirt Design! DJ Serious at the beach. DJ Serious Ladies Beach Tee. Rock My Brand. Or don't. Rock my Brand. Or Don't. Happy Valentine's Day! I love this mix, and I think you will too. 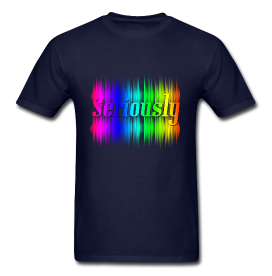 New T-Shirt design available on Zazzle.